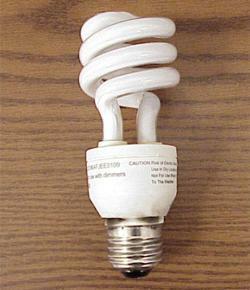 NORTHBROOK, Ill., - Oct. 26, 2004 - Underwriters Laboratories Inc. (UL) is notifying consumers that Globe Mini-Spiral, 13 Watt, self-ballasted lamps bear an unauthorized UL Mark and may pose a potential fire and electric shock hazard. Date of Manufacture: January, 2002 through April, 2003. The date code is BHWWYY or BHWWY where WW signifies the number of the week that the product was produced and YY or Y signifies the year in which the product was manufactured. Therefore, date code BH0702 signifies that the lamp was manufactured in the 7th week of 2002, or BH342 signifies that the lamp was manufactured in the 34th week of 2002. Hazard: The lamps were manufactured with parts that UL did not investigate. These parts can fail and melt a hole in the enclosure, posing a fire hazard and exposing the user to hazardous voltage. These lamps are not authorized to bear the UL Mark. Identification: The units are marked "Globe Mini-Spiral, 13 W, 120V, 60Hz, 225mA." The products also bear an unauthorized UL Mark with the UL file number "E197131." What you should do: UL recommends that users stop using the lamp immediately and return it to the place of purchase. Sold at: Retailers in the United States and Canada.